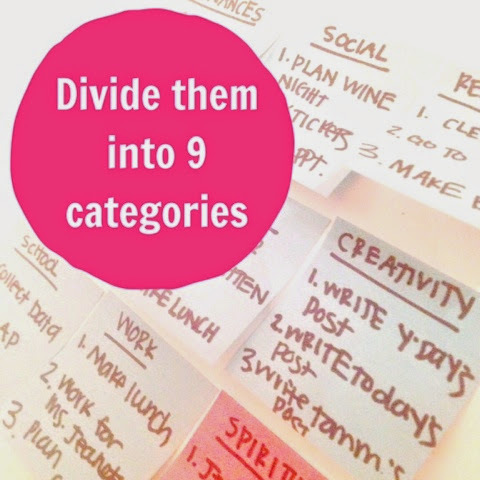 If you’re a crazy obsessive-ish person like me, you’re driven by deadlines. Something can be completely unimportant, but the second that someone gives it a deadline it becomes my number one priority! Last month, I had a ton of papers due for my research project. Okay, it was just four; one a week. But I got so caught up in writing them that I literally forgot to eat lunch every day in September. I FORGOT TO EAT. What the heck? Who does that?! I forgot to pay bills. I forgot to return e-mails and phone calls… I was a hot mess. As I laid (or lay?) 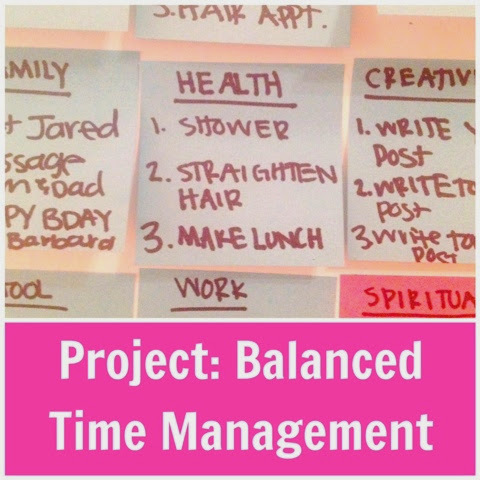 in bed one night, unable to go to sleep because my mind was racing thinking of how my non-school-related-to-do-list had gotten impossibly long, I realized that I was feeling overwhelmed because I was unbalanced. It’s so true! School and work are just a part of our lives, yet it’s so easy to zone in on them and feel like that’s all we do! So, stay with me as I get a little hippie-ish for a minute and let’s try to balance out our lives! (by the way, these are reeeally simplified categories... you can read about the complete ones here). When we are allotting a somewhat proportional about of time to each section, we feel happy and healthy. However, if we are too obsessed with focused on one aspect of life, we tend to get off balance. And that keeps us from feeling happy! 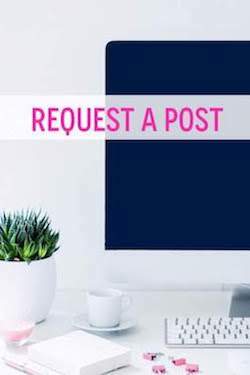 So, if you’re feeling overwhelmed or stressed out, there is a good chance that you’re zoning in on one thing and missing out on something else that you totally need! To fix this problem, here is what I did: I got out 9 of those small, 2x2 Post-It’s and stuck them on the wall. That’s right, ON THE WALL. They weren’t even color-coded, or anything! See that pink one? It it literally just means that I ran out of blue. 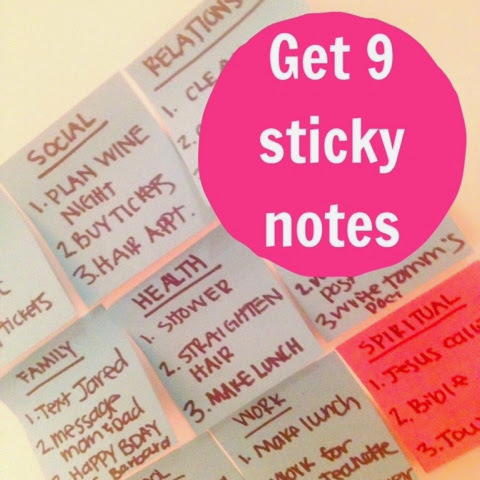 I treated these Post-It's like the 9 areas of my life and wrote a category on the top of each note. 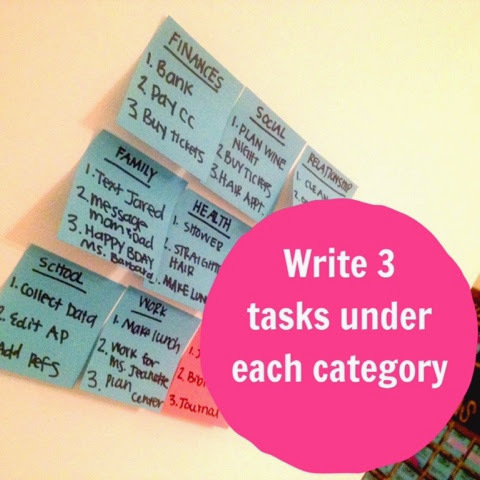 Then, I wrote the top 3 most pressing tasks I could think of under each category. Seeing it all organized like that made me feel immediately better! In the Relationship square, I wrote down simple things like going to the park with my husband or cleaning the coffee maker (something that makes him super happy). In the Creativity square, I wrote all of my stuff to do for Organized Charm! Spiritual is probably the easiest one to blow off every day when things get hectic… but I’ve found that, if I make time for it every morning, I really have a more positive attitude throughout the day! BTW, this is actually my to-do list for today… Don’t you just love it when you have to schedule in time to “shower”? Finally, let’s just work on spending an *equal* amount of time on each square! It may even be 10 minutes but, hey! 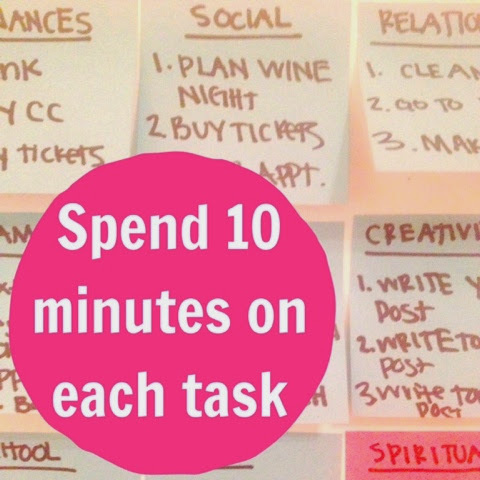 We can accomplish more than we think in 10 minutes! In the future, let's try to start managing our time like this everyday! Do you ever feel like you’re “zoned in” on one aspect of life? How do you balance and keep up with everything?